Please Take Note: This is a review of the final game, but it might change slightly based on the success of the Kickstarter campaign. The game is being reviewed on the components and the rules provided with the understanding that “what you see is not what you might get” when the game is published. If you like what you read and want to learn more, we encourage you to visit the Kickstarter campaign. Now that we have all that disclaimer junk out of the way, on with the review. It was a somber moment. Surrounding the dying Queen were each of her daughters. They had grown from helpless babes to strong young women. The Queen knew that each of her children would rule the land wisely, but there was only one throne. In her last moments, she told her daughters that the kingdom would go to the princess who brought the most prosperity and glory to the people. Then she passed quietly and peacefully. The Queen is dead, but a new queen will soon rise. Monarch, a self-published game designed by Mary Flanagan, Max Seidman, and Zara Downs, will reportedly be comprised of 6 “Unwanted Guests” Market cards, 38 “Court” Market cards, 22 “Land” Market cards, 8 “Moon” Market cards, 6 “Simple Farms” Starting Land tiles, 6 “Small Villages” Starting Land tiles, an assortment of Food and Gold tokens (in the values of “1” and “5”), 5 Banner cards, and 4 Reminder cards. As this is a review of a prepublished game, we will not comment on the game component quality. However, I was provided a glimpse of the planned artwork. The art direction by Sarah Ettinger and Zara Downs is excellent. It captures the majesty of court and all the romance of royalty. The illustration by Kate Adams that I was provided are wonderfully detailed and will strengthen the game’s theme and narrative nicely. That being said, all the examples you are about to see in this review really are nothing more than placeholders for what is to come. To set up the game, first take all the Starting Land tiles and shuffle them. Deal out 9 tiles, face-up, to create a 3 x 3 grid in the middle of the game playing area. Place any remaining tiles back in the game box. Second, take all the Market cards and shuffle them together to create the Market deck. Place the Market deck face-down and draw the first 5 Market cards, placing them face-up in a row next to the Market deck. If a “Moon” Market card is drawn, discard it above the Market deck face-up and draw a new Market card. 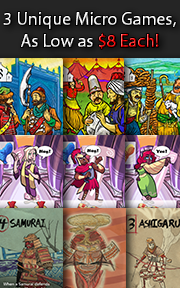 Third, place the 5 Banner cards above the 5 Market cards drawn in the previous step. The order in which the Banner cards are placed is not important. Fourth, give each player 5 Food and 5 Gold tokens. Place the remaining tokens to one side of the game playing area. This is the Gold and Food token pools for the duration of the game. Assign one player to be the “Banker” to help the game move along at a quick pace. Every noble knows that it’s important to be familiar with the land and its people. To rule wisely and compassionately, you must be aware of the challenges everyone faces. These lessons are important to remember and serve as the foundation on which all strong monarchies are built. Let’s take a quick tour of the kingdom to get a better idea of what’s to come. The Land tiles represent the small farms and villages that dot the kingdom. The starting kingdom is small, but healthy. There is food for the people and wealth enough to cover expenses. However, the Queen’s command was to make the kingdom more prosperous than what it is. As such, the players will need to use the resources it provides and spend them wisely to stimulate growth. Depending on random set up of the grid at the start of the game, the kingdom might be producing more Food than Gold or vice versa. The Market cards are the real focus of the game. Players will be using them to increase their royal standing, improving the infrastructure of the kingdom, and hindering their opponents. But nothing is free, even if you are royalty. Players must use their resources to purchase prestige and the ability to rule. There are 3 types of Market cards. Each are summarized her. Court cards are played in an area in front of the player, face-up, referred to as the “Court”. Here the player will be adding to their royal standing by collecting cards that have a Crown points. 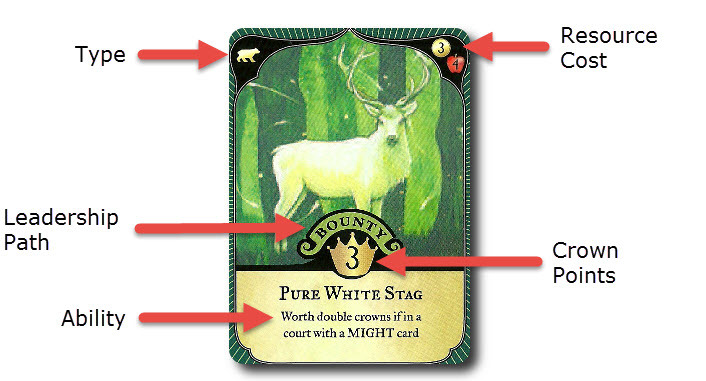 Some “Court” Market cards not only provide Crown points, but also have a special ability. If the effect of the ability can be resolved, the player does so before continuing their turn. Sometimes the card’s ability is only used during scoring. A few of the “Court” Market cards will also have a type symbol. These are used to determine the effects of abilities other cards provide. There are some “Court” Market cards where the Crown number value is listed as “?”. In these cases, the number of Crowns the “Court” Market card is worth is dependent on how many cards the player has that match the requirements listed. Players can replace “Court” Market cards for better ones if they like or add to their Court area. This is especially important because some “Crown” Market cards are worth no points if they are in the same Court area as other cards. There are also “Court” Market cards that are not helpful which are referred to as “Unwanted Guests”. These have a negative Crown number value and cannot be replaced by other “Court” Market cards, bur nor do they take up a space in the player’s Court area. Players receive Unwanted Guests from their opponents who give them to the player after purchasing them from the Market row. 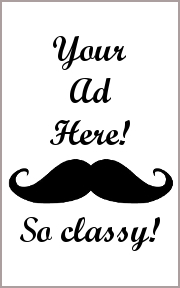 The player must put these cards next to their Court area when the Unwanted Guest card is given to them. There are cards in the game that allow the player to remove Unwanted Guests, but they will have to hunt for them. 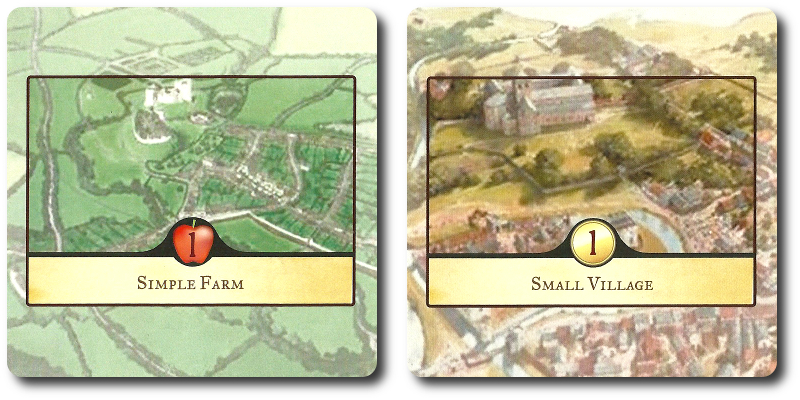 “Land” Market cards allow the player to improve “Small Village” and “Simple Farm” Land tiles by essentially upgrading them. Upgrades to “Simple Farms” increases the number of Food resources the Land tile provides and improvements to “Small Villages” increases the number of Gold resources. A single Land tile can be upgraded multiple times as long as the new upgrade increases the number of resources the Land tile provides. Put another way, players cannot degrade a Land tile resource output. When a player upgrades a Land tile, all the players benefit. The resources that Land tile provides belong to whatever player is taking their turn at that moment. As such, by improving the amount of Gold and Food you can take during your turn, you are also giving your opponents the same boon. There are a small number of “Moon” Market cards that will eventually be drawn and revealed during a Market row sweep or replacing a recently purchased Market card. “Moon” Market cards represent events that are out of the players’ control and cannot be planned for. Sometimes the card will be beneficial and sometimes not. When the “Moon” Market card is revealed, read the card’s text out loud and resolve it. After all the players have resolved the card, the “Moon” Market card is removed for the duration of the game. “Moon” Market cards are never placed in the Market discard pile except when drawn during the game set up. 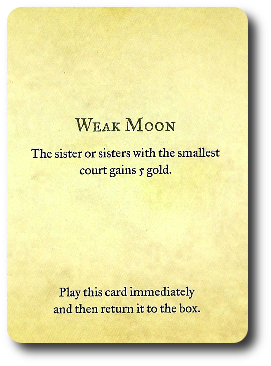 For example, “Weak Moon” asks all the players to quickly count the number of cards they have in their Court area. The player who has the least number of cards is given 5 Gold. The Banner cards represent the “Five Paths of Leadership”. The 5 paths are “Might”, “Culture”, “Wisdom”, “Bounty”, and “Balance”. These 5 paths can be found on the “Court” Market cards. During the game, a player can elect to take 1 of the available Banner cards above the Market row and claim it as their own if they have met the Banner card’s requirements. This is now the player’s selected leadership path and it changes the game a great deal. By selecting a path, the player earns a special ability that is made immediately available to them and them alone. At the end of the game, the player receives additional Crown points for meeting certain criteria within her Court area and among the realm. 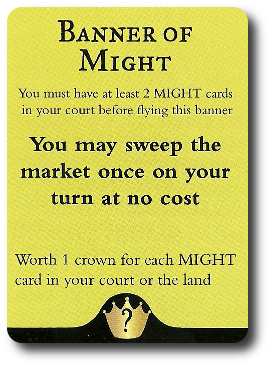 For example, the “Banner of Might” Market card can only be taken by a player that has at least 2 “Court” Market cards in their Court area that list the “Might” path. If they do, they can take the “Banner of Might” card and can now sweep the Market at no cost once per turn. 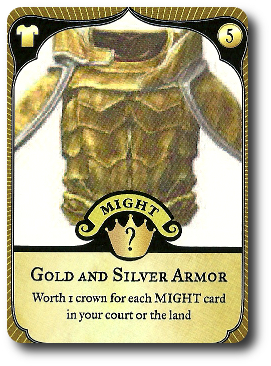 At the end of the game, the player receives +1 Crown points for every “Court” card they have with the “Might” path, as well as receiving +1 Crown points for every Land tile that lists the “Might” path. Monarch is played in rounds and turns. A single round is completed when all the players have had 1 turn. The turn order sequence starts with the first player and goes clockwise. A player’s turn consists of one or more actions. Where noted, an action can be taken only once per turn or multiple times per turn. The available actions are as follows and can be taken in any order. Once the player is done taking actions, they announce their turn is over. If the player meets the requirements listed on the Banner card, they can claim it at no cost, placing it next to their Court area for all to see. The player is now following the leadership path identified by the Banner and can use the special ability whenever they like. Players can only claim a Banner once and only if they meet the requirements. Banners can never be stolen, nor can they be given. Only once per turn, the player can decide to “Harvest” or “Tax”. This action allows the player to take tokens from the Food pool and add them to their own resource supply. The number shown in the “Apple” symbols found on the “Simple Farm” Land tiles is the number of Food tokens to be collected. When the Harvest action is taken, the player takes a number of Food tokens equal to the total number of Food resources made available from “Simple Farm” Land tiles in the grid. Simply add the numbers in the “Apple” symbols together and then collect that amount of Food tokens. This action allows the player to take tokens from the Gold pool and add them to their own resource supply. Taxation, however, is a bit more complicated than Harvesting. A player must pay 1 Food for all the “Small Village” Land tiles in play before they can tax the subjects of their kingdom. 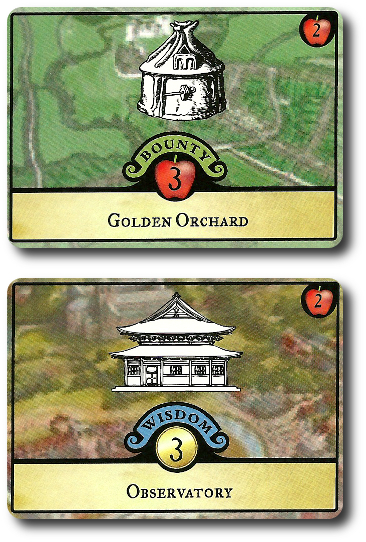 For example, if there are 4 “Small Village” Land cards in play, the player would have to pay 4 Food to the Food pool. Once all the villagers have been fed, the player collects the total amount of gold shown for all the “Small Village” Land card in play in the grid, taking the Gold from the pool and adding it directly to their supply. Note: As the game progresses, the Land tiles will be upgraded. The amount of resources they provide during the Harvest or Tax action will increase, but a player only ever pays 1 Food per village when collecting Gold from the Tax action, regardless of any improvements in play. The cards face-up in the Market row are available to the player to purchase and use. The player must pay the cost of the card (a combination of Gold and Food resources, most of the time) before they can take it from the Market row. “Court” Market cards are placed in the player’s Court area immediately. 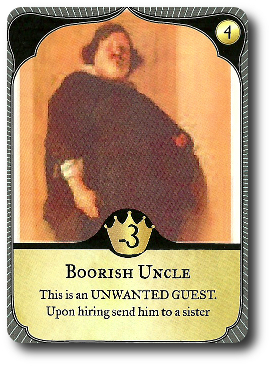 “Unwanted Guests” Market cards are given to any opponent of the player’s choice after being purchased. Improvements and upgrades to “Small Village” and “Simple Farm” Land tiles are placed on top of the tile and previously placed improvements. The value shown on the Market card is the tile’s new resource value when players Harvest or Tax. After the card is purchased, a new card is drawn from the Market deck to replace it. In the event of drawing a “Moon” Market card, resolve it, discard it, and then draw a new Market card. If the Market deck should ever be exhausted, shuffle the Market discard pile and place it face-down to create the new Market draw deck. The player pays 3 Gold tokens to the Gold pool from their own resource supply. They can then take all the cards in the Market and place them in the discard pile. The player then draws 5 new Market cards from the Market deck. This can be done as many times as the player likes during their time as long as they have the Gold to pay for the action. In the event of drawing a “Moon” Market card, resolve it, discard it, and then draw a new Market card. If the Market deck should ever be exhausted, shuffle the Market discard pile and place it face-down to create the new Market draw deck. The game continues as described above until 1 player has collects 7 “Court” Market cards to their Court area. The round ends and all players now calculate their total Crown points listed on the cards in their Court area. “Unwanted Guests” reduce Crown points, while Banner cards will increase Crown points. When counting Crown points, players should pay close attention to any special abilities and conditions that might reduce some Crown number values and increase others. 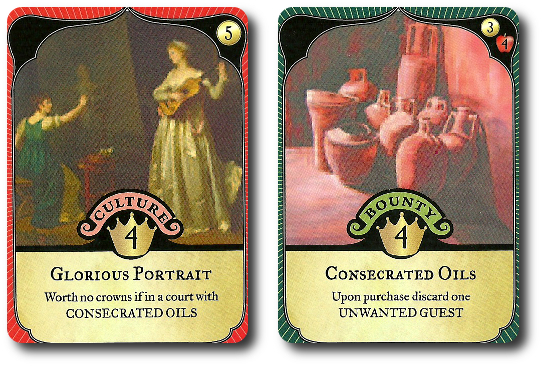 For example, if the player has the “Glorious Portrait” card and the “Consecrated Oils” card in their Court at the end of the game, “Glorious Portrait” is worth zero Crown points! When all the easy math is done, the player with the most Crown points wins and is hailed as the new ruler of the land. For an easier game or playing the game with younger players, consider removing the Banner cards from play. While the Banner cards are not difficult to use during the game, they do add an additional level of strategy, tactics, and depth that might be a bit overwhelming for an inexperienced player. Randomly dealing Land tiles during game set up is fine, but sometimes results in a strange mix of resources. Our Gamer Geeks refused to play unless the land was set up randomly, but our more casual players and our Child Geeks wanted a kingdom that was in balance. We made sure our games had 4 “Simple Farms”, 4″ Small Villages”, and then randomly determined if the 9th Land tile should be a farm or village. To learn more about Monarch, visit the Kickstarter campaign. The Child Geeks jumped right into this game and quickly learned that selecting cards to purchase was only half the puzzle to solve. Resources quickly dwindle and the more time you spend collecting them, the less time you have to spend them. Some of the Child Geeks adopted a pattern of collecting Food, then Gold, and then purchasing a Market card. This worked, but only in the sense that it allowed them to participate in the game. The Child Geeks that remained competitive purchased Market cards that provided extra bonuses and contributed back to the overall economy to increase the amount of resources collected. According to one very competitive Child Geek, “All you have to do is build up just enough resources so you can buy at least 2 cards at a time.” But adding to one’s own court was not enough. As one Child Geek put it, “You need to send annoying people to the other players as often as you can. Then you don’t have to worry about them getting too many points.” When the games were over all the Child Geeks agreed that Monarch was a game they enjoyed. The Dragon has been revealed! The Market just got really interesting! The Parent Geeks were underwhelmed at first. From their perspective, the game looked too simple. According to one Parent Geek, “It looks like all I have to do is buy cards faster than everyone else and skunk them to win the game.” The Parent Geeks quickly learned that there was more to Monarch than just buying cards as quickly as possible. As one Parent Geek put it, “The really interesting thing about this game is that you have to spend time to build the economy and time to build you court, while at the same time do what you can to damage your opponent’s courts. That’s a lot to think about!” The only aspect of the game the Parent Geeks did not like was the game’s length. Turns out they wanted it to last a bit longer. In the words of one Parent Geek, “It stinks when you are only one turn away and the game ends right before you make your big move.” All the Parent Geeks voted to approve Monarch, finding it to be an excellent casual game that was enjoyable with friends and family. The Gamer Geeks, like the Parent Geeks, were at first unimpressed. One Gamer Geek said, “So, we just buy cards after collecting resources? Is that really all there is to the game?” At first, yes, but combining “Court” Market cards with Banner cards gives the player a real advantage. They then score not only their own court, but the land, as well. This intrigued the Gamer Geeks and they explored how deep the game could possible go. Turns out, not as deep as the Gamer Geeks would have liked. According to one Gamer Geek, “I think this is a good enough game for casual players, but there are a few aspects that keep me from approving it. First, the market randomness. I want to buy specific Leadership Paths, but I can’t. Second, I don’t like that I can only collect 1 resource type at a time, but I can buy as much as I want. That feels odd. Third, and finally, I want there to be more player interaction. It has enough for casual players, but not for a player like me.” But not all the Gamer Geeks agreed. In fact, a number of them enjoyed the game well enough to defend it. As one Gamer Geek said, “This is a casual game, but you have to think through your moves. You can’t win if you don’t consider your opponent, consider the table, and then consider your options. I like games like this because they are great for casual game nights and filler.” The Gamer Geeks had a split vote, resulting in a mixed level of endorsement by the gaming elitists. 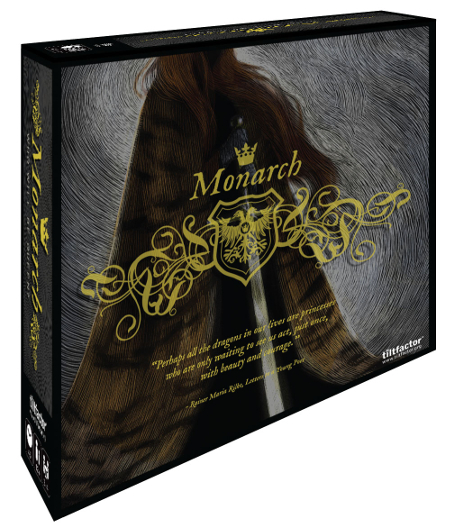 I found Monarch to be an excellent game for casual game nights and playing with the family. The game makes you think without taxing your brain, but this is not a game you can simply coast through. Cards can hurt your points if you don’t build your Court area intelligently. Giving players the ability to swap out cards also gives them the ability to experiment without fear of long-lasting penalties. For the players who want to be competitive, there are many ways, some very subtle, to earn points. There are combos to be had and you can piggy back on your opponents to earn points, too. The only difficult decision a player needs to make in the game is whether or not to purchase a Market card. The second most difficult decision is what card, because pretty much everything in the Market is affordable. That’s enough for our younger members and casual players to mentally chew on. For the gaming elitists, it felt like a tease. Which, I would argue, speaks highly of the game itself. It has everything the Gamer Geeks want, but not enough of it to keep them engaged. Not a problem for some of our Gamer Geeks who really enjoyed the casual and yet competitive play the game provided. It all comes down to how heavy you want your game playing session to be. I recommend using the Banner cards immediately. Making them available lets the player decide if they want to use them or not. There is no penalty for using them whatsoever other than not attempting to use them, which would be silly. Banner cards promise points, but demand the player focus their Court area and concentrate on specific cards. That might seem limiting, but that level of focus helped our younger players a great deal. Instead of just purchasing what they could afford, they purposely waited for opportunities. Sometimes that meant not purchasing anything for 2 or more rounds. This is a solid game. It has a good mix of resource management, hand management (using your Court area), player interaction (Unwanted Guests), and the most crucial piece, just enough depth to give the players room to explore their own paths to victory. The Banner cards were the final touch that won me over, but the game was a joy from the start. I would recommend this game to any Child Geek and Parent Geek without hesitation. The Gamer Geeks will have to decide for themselves if this casual game has enough strategy and tactics to win them over. 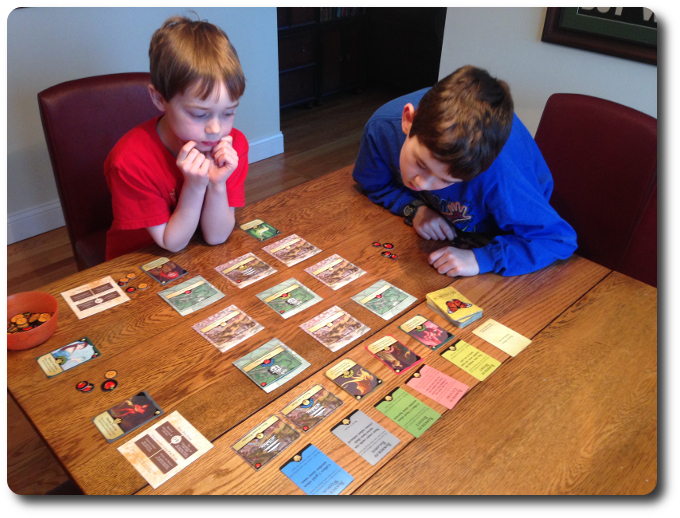 Tagged Card Games, Child Geek Approved, Civilization Games, Medieval Games, Parent Geek Approved, Prepublished Games. Bookmark the permalink.